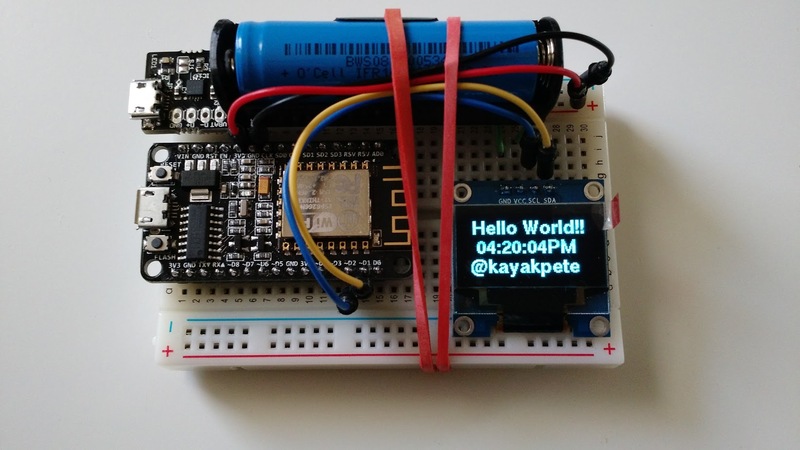 Let's use the ESP8266 to create a timepiece. This is the foundation for a internet-connected smart watch. An ESP-01 would do as well, but you would need different wiring and a USB to TTL converter. This is a very simple project to test a display connected to an ESP8266. It was so easy I went to the next level to turn it into a timepiece. While I am using a nice LiFePO battery, you could use any other 3.3v power source. Connect your power + to the ESP VIN and OLED VCC. Connect your - to GND on both boards. Now cross-connect your ESP D1 to the OLED SDA and the ESP D2 to SCL. You should be all set! Connect the ESP to esplorer or your favorite way to program IT, and load clock1.lua the code in the code section. Not that this is LUA code. I highly recommend esplorer. Make an adjustment to the code to connect to your wifi. Step 3 - Fire it up! This program connections to your wifi, and then gets the time. Then displays the time. Magic! How can you expand this code to make this watch smarter? Add a temperature sensor? Or have it get more data from the Internet? Show me what you can do! Connect the following ESP pins to the OLED pins. -- This program gets time from the Internet, and displays it on the OLED. "User-Agent: Mozilla/4.0 (compatible; esp8266 Lua;)"..